An Giang (VNA) – The Mekong Delta province of An Giang posted an import-export revenue of 248.8 million USD in the first quarter of 2019, a surge of 29.42 percent year-on-year. The figure was reported by Deputy Director of the provincial Department of Industry and Trade Doan Minh Triet at a conference held on April 2 to review the province’s socio-economic situation in Q1 and launch tasks for the following quarter. The province earned 211.8 million USD from export in the period, jumping 29.65 percent compared to the same period last year and hitting 23.8 percent of the year’s plan. Most export staples of the province such as rice, fish and vegetables recorded increases in the first three months. Notably, An Giang shipped 42,780 tonnes of rice abroad, raking in 21.8 million USD, attributable to surging demands in not only traditional export markets of Indonesia, the Philippines and Malaysia but also new ones such as Bangladesh. The province’s rice has been exported to 38 countries, with the Asian market accounting for the lion’s share of 84.67 percent. Meanwhile, An Giang shipped 29,000 tonnes of frozen aquatic products abroad, collecting 69.6 million USD, an increase of 8.09 percent in volume and 8.08 percent in value year-on-year. 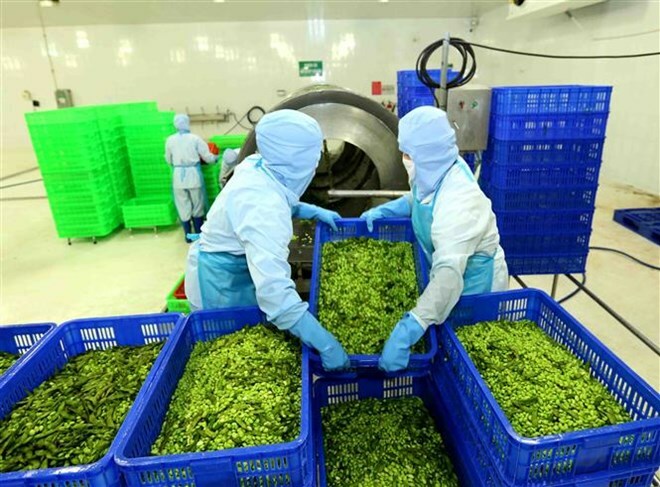 The province was also able to export 2,100 tonnes of frozen vegetables to 23 countries, including 11 European nations, bringing in 3.5 million USD. In the coming time, An Giang’s rice export may face tough competition from major rice exporters of the world like Thailand and India, along with emerging ones, namely Cambodia, Myanmar and Pakistan. However, export of frozen aquatic products, particularly tra fish (pangasius), is projected to surge with new markets, thanks to increasing demand in Asian countries, especially China.